My jazz festival feature show coming up this week!! Playing this weekend with Meaghan Blanchard .. opening for Alan Doyle, Jimmy Rankin, and Blue Rodeo!! Completely diggin my new Fender Modern Player Jazz Sating in TT Burst! Charlottetown Festival Orchestra (Anne of Green Gables, Canada Rocks, Evangeline), Dennis Lee Project, Late Night at The Mack, Groove Company, Jive Kings, Ian Toms, Meaghan Blanchard, Amanda Jackson Band, Winterjazz, Island Jazz, The Collective, Beck Sisters, Terry Hatty,....and more.. He is one of the top calls in town, working with many artists in various styles. 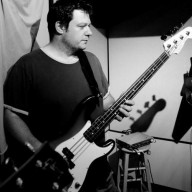 Deryl has tracked bass on more than 26 recordings in his career and currently is the classical bass professor at the University of PEI and one of the bass instructors at the Holland College School of Performing Arts.